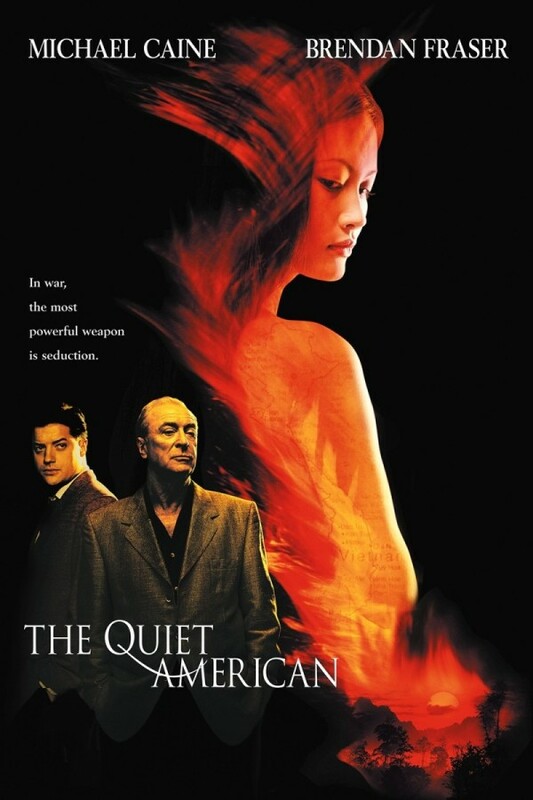 Based on Graham Greene’s most famous book, The Quiet American uses tandem plotlines to reveal a metaphor. Set in Viet Nam before the French withdrawal, the plot centers around an American who arrives and befriends the locals, then starts to seize both power and the wife of a friend. It shows the vitality of America — at that time it was still alive — contrasted to the senility and squalor of the European soul, while the impassive and fatalistic Asiatics watch on from the sidelines. It also reveals the American method of taking power in the name of helping those who will soon be ruled. The Hollywood types insist on casting this film as somehow being about seduction, when in fact as in the book, the plot involves the opposite: Alden Pyle, a “quiet American,” arrives in Viet Nam with a cover story of working in a medical mission and a secret identity as a CIA operative. He begins to plan a coup to deliver the country from what he sees as its twin evils of decrepit French rule and sadistic Communist murderers. The plot unfolds through the eyes of the protagonist, a journalist named Thomas Fowler, who is equal parts personally dysfunctional and credulous when it comes to certain sacred illusions that he holds. As he and Pyle rampage through pre-war Saigon, they compete for the attention of Fowler’s Vietnamese lover, Phuong. Eventually ideological and romantic differences split the two friends, culminating in an act of betrayal that mirrors European cackling delight in American foreign policy failures. While the metaphor seems heavy-handed, it plays out deftly through unexpected but mundane events, courtesy of the unpressured and wily storytelling of Greene’s book. Unlike most Hollywood films, this one stays on task and avoids both being random and repetitive, which moves the plot along unobtrusively so that its most intense moments can stand out as being as shocking as they would be in real life. Brendan Fraser portrays an excellent Pyle, both boyishly well-intentioned and duplicitous like a 1950s teenage hoodlum on the make. Michael Caine, who must have his agent read 10,000 scripts a year in every known genre of film so he can pick challenging parts without regard to category, portrays Fowler accurately as a somewhat fuzzy-headed journalist who is barely able to escape the disaster of his own personal life, and consequently who finds hope and interest in external events that he will not permit for himself. The filmmakers distill this complex book into an hour and forty minutes of film, set in richly saturated color and decadent ruins of once-elegant French homes. While it lacks the clear moral lines that moviegoers enjoy, it reveals a moral depth in multiple directions that opens up possibilities for new ways to reflect on life, self-discipline and politics all at once.